"actuary" means a person as defined in the Retirement Benefits Authority Act. "appointing bodies" means bodies responsible for appointing and nominating members of the Board. "deed of adherence" means the legal instrument to be executed by the employer who joins the scheme after the commencement date of the scheme and which shall bind that employer to the scheme's rules. "existing schemes" means Laptrust (Umbrella) Retirement fund, (LAPTRUST DC and DB /LAPFUND) and any other. "trustee" means a member of the Board of Trustees established under section 7. 3. This Act applies to all eligible employees of the County Governments and Associated Organisations. 4. A public officer or any other person approved by the Board may become a member of the scheme under the auspices of a sponsor. (e) establish transitional provisions for existing schemes. 6. (1) There is established the County Governments' Retirement scheme. (e) doing or performing all such other things or acts as may be necessary in furtherance of its purpose and functions. (d) such other benefits as may approved by the Board under this Act. (f) the chief executive officer who shall be an ex officio member and the secretary to the Board. (b) appointed by notice in the Gazette. (3) A chairËrson shall be elected by the trustees from among the trustees set out under subsection (2). (4) The Cabinet Secretary shall appoint the persons nominated subsection (2) by notice in the Gazette. (5) Regulations shall prescribe the procedure for nomination and appointment of the Trustees under subsection (2). (d) meets the requirements of leadership and integrity set out in Chapter Six of the Constitution. (c) is disqualified under the provisions of any other written law from appointment as such. 10. (1) A Trustee appointed under section 7 shall hold office for a term of three years and be eligible for reappointment for one final term of three years based on performance. (f) failure to meet the requirements of leadership and integrity set out in chapter six of the Constitution. (2) Before the Cabinet Secretary makes a decision under subsection (1), a Trustee must be given an opportunity to provide a defence against any allegation. (3) Notwithstanding subsection (1), the Authority may remove a trustee on grounds specified in the Retirement Benefits Act. 13. Where a vacancy occurs in the membership of the Board under section 11 or 12, the Cabinet Secretary shall appoint a new Trustee in accordance with the provisions of this Act. (h) perform any other functions assigned to it under this Act or any other law. 15. (1) In the exercise of its functions the Board shall be accountable to the sponsors and the members of the fund. (2) The Board shall have all powers necessary for the proper performance of its functions under this Act. (i) undertake any activity necessary for the fulfilment of any of the functions of the scheme. (4) The Board may subject to such conditions as it may think fit, by directions in writing, delegate any of its powers to any one or more of the Trustees or to the Chief Executive Officer or employees of the scheme. 16. (1) The Board may establish sub committees for the better carrying out of its functions. (2) The Board may co-opt to sit in the sub-committees such persons not exceeding three to sub-committees established under subsection (1) having such knowledge or expertise as the sub-committee determines necessary for the performance of its functions under this Act. 17. The Trustees shall be paid such remuneration or allowance as the Board may determine in consultation with the Salaries and Remuneration Commission. 18. (1) The business and affairs of the Board shall be conducted in accordance with the Schedule. (2) Except as provided in the Schedule, the Board may regulate its own procedures subject to compliance with the Retirement Benefits Act. (3) The Board may invite any person to attend any of its meetings and to participate in its deliberations, but such person shall not have a vote in any of its decisions. 19. (1) There shall be a chief executive officer of the scheme who shall be competitively recruited and appointed by the Board. (2) The chief executive officer shall be appointed by the Board of Trustees on such terms and conditions as may be specified in the instrument of appointment. (e) meets the requirements of Chapter Six of the Constitution. (d) any other function that may be assigned by the Board. (5) The Board may appoint the chief executive officer as the administrator of the scheme. (6) The chief executive officer shall be appointed for a term of five years and shall be eligible for re-appointment for one further final term of five years based on satisfactory performance. (e) conducts himself in a manner deemed to be inconsistent with this Act. (b) an opportunity to be heard either in person or by a legal representative. 20. (1) The Board may employ such other employees as it may consider sufficient for the performance of its functions under this Act. (2) The terms and conditions of service of employees of the scheme shall be determined by the Board. 21. (1) The common seal of the scheme shall be kept in such custody as the Board may direct and must not be used except on the order of the Board. (2) The common seal of the scheme when affixed to a document and authenticated shall be officially noticed and unless the contrary is proved, an order or authorization of the Board under this section shall be presumed to have been given. 24. (1) The scheme shall be administered by an administrator appointed by the Board. (g) carry out any other functions as may be directed by the Board from time to time. (3) The administrator that distribute to the credit of the members retirement savings accounts all income earned from the investment of the fund save for clearly defined and reasonable fees, charges, costs and expenses of transactions approved by the Board. 25. (1) A member shall, so long as the remains in the employment of a sponsor, contribute not less than seven and a half percent of his pensionable emoluments to the scheme. (2) A sponsor shall contribute to the scheme fifteen per cent of the pensionable emoluments of every employee who is a member of the scheme and the amounts necessary to cover the premiums for Insured Benefit. (3) Subject to such guidelines as the Board may from time to time issue a member of the scheme may make voluntary to the scheme. (4) All Contributions to the scheme by a members and a sponsors shall be reduced by the amounts of the contributions to National Social Security fund by and in respect of the members. (5) In to the contributions specified in subsections (1) and (2), the sponsor shall take out and maintain a life insurance policy that has disability benefits in favour of every member of the scheme, for a minimum of three times of the members annual pensionable emoluments. (6) Contribution required to be made under subsection (1) and (3) shall be deducted by a sponsor from the salary of the contributor on each occasion on which the salary is paid and shall be paid into the scheme together with the sponsor's contribution before the tenth day of every calendar month or before any other day which may be notified in writing and approved by the Authority. (7) Contribution not paid to the scheme by a sponsor within ten days after the last day of the calendar month to which the Contributions relate shall interest during the period they remain unpaid at a rate specified by the Board from time to time provided that such rate shall not be less than the rate specified in the Retirement Benefits Act and Regulations. (8) All unpaid contribution and interest there on shall constitute a civil debt of the respective sponsor and shall be recoverable summarily by the Board as provided for by law. (9) The Board shall report to the authority at such intervals as specified by the Authority all remittances of contribution outstanding and not received after the deadlines specified herein. 26. All the benefits derived from Contributions by a member and a sponsor shall vest immediately in the member. 27. (1) A member shall not withdraw membership or Withdrawal of membership or retirement benefit from the scheme while the member is in benefits. the employment of a sponsor. (ii) the balance shall be retained in the scheme and continue to accrue interest until the member attains early retirement age; or transferred to another registered scheme of the members choice. approved the payment of the retirement benefits and submitted, fourteen days prior to payment of the benefits, the approval to the Authority. 29. (1) Notwithstanding the provisions of section 28, any member who retires on attaining the early retirement age is entitled to make withdrawals in accordance with section 28. (b) liable to be attached in settlement of any claim. (3) The payment of a retirement benefits shall commence from the end of the month immediately following the month of the retirement of the member. (4) Every payment of benefits from the scheme may be subject to deduction of the amount outstanding due by the member under any mortgage guarantee facility approved by the Board. 31. (1) Every member shall provide their particulars and those of their dependants to the administrator in the prescribed form. (2) A member may update the particulars provided under subsection (1) at any time and, in any event, at least three years before retirement. 32. (1) If a dispute relating to the person nominated as a beneficiary under this part arises, the Board has power to consider evidence presented and determine the rightful dependant. either on its own motion or on the application of a party, to make such decisions as may be necessary. 33. If upon the death of a member, benefits are paid to a person validly nominated under this part, no person shall have claim to the benefits against the fund. 34. (1) Upon the death of a member, the benefits accrued to the member shall be paid to the person whose particulars the member had provided or at the Board's discretion as provided in the Retirement Benefits Act and Regulations thereunder. (2) In the absence of a nomination, the Board shall apply the benefits referred to in subsection (1) to such of dependants of the deceased and in such amounts as the Board shall in its discretion determine. (3) Where a dispute arises under this section, the Board shall consider any evidence presented before it and determine the rightful beneficiary. 35. (1) Where a member is missing and it is proved that the member has not been heard of for such period as prescribed by the law relating to presumption of death by those who might be expected to have heard of the member if that member was alive, there shall be a rebuttable presumption that the member is dead as provided under the law. 36. (1) If a member who was receiving a retirement benefit under an income drawdown dies, a benefit that is equivalent to the unutilized balance of the account of the member shall be paid to the nominated beneficiary of the member. (2) The payment under subsection (1) shall be made to the beneficiary either as a lump sum or as an annuity commencing from the day following the death of the member. (g) monies from any other source provided or donated or lent to the scheme. (b) the expenses incurred in the management and administration of the scheme subject to the limits provided under this section. (f) all monies from any other source provided for or donated or lent to the Board. (5) Unspent monies budgeted for annual administrative expenses shall lapse back into the fund at the end of the financial year. (6) The Board may invest any surplus monies held in the account established under this Act in asset of classes approved under the Retirement Benefits Act. (b) any income of the scheme that the Board determines should be set aside to stabilize the returns to members subject to a maximum of ten percent of such income with consideration to the Income Tax Act Regulations. (4) No money shall be drawn out of the reserve account except as directed by the Board. (5)Any monies determined to be income of the reserve account shall be treated as income forming part of the general income of the scheme. 40. (1) Before the commencement of each financial year, the Board shall cause to be prepared estimates of the revenue and expenditure of the scheme for that year. (g) such other matters as the Board may consider fit. (3) The annual estimates shall be approved by the Board before the commencement of the financial year to which they relate. (4) The expenditure of the scheme shall not be incurred except in accordance with the annual estimates approved by the Board. 41. (l) The Board shall cause to be kept proper books and records of account of the income, expenditure, assets and liabilities. (a) balance sheet showing in detail the assets and liabilities of the scheme as at the of the financial year. (c) Such other statements as may be required by the Authority. 43. Annual investment income earned by the scheme shall, after deduction of all expenses and costs properly paid out of the scheme and any appropriation to a reserve account approved by the Board, be credited to members' accounts on a pro-rata basis. 44. (1) The scheme may be reviewed by an actuary appointed by the Board as provided for in the Retirement Benefits Act may be considered by the Board. (3) The Actuary shall submit the report prepared under subsection (2) to the Board within the stipulated time in the instrument of appointment. (4) The Board shall, within six months of the receipt of such report, consider any recommendations made by the Actuary and in so doing, may take any action recommended by the Actuary. 45. Where there is a conflict between the provisions of this Act and the provisions of the Retirement Benefits Act, the provisions of the Retirement Benefits Act shall prevail. (b) take reasonable care to ensure that the management of the scheme or safe keeping of the assets of the scheme is carried out in the best interests of the members of the scheme. (b) report to the Board and the Authority, as soon as is reasonably practicable, if a sponsor has not remitted the required contribution and such remittance remains due for more than ten days. 47. No action or omission by any member of the Board, or employee of the scheme shall, if the act was done in good faith for the purpose of carrying out the provisions of this Act or any other law, subject the person to any liability, action, claim or demand. (c) being a Trustee or employee of the scheme, wilfully misappropriates the assets of the scheme, commits an offence and is liable on conviction to a fine not exceeding five million shillings or to imprisonment for a term not exceeding two years or to both. (b) purporting to act in any such capacity as provided in paragraph (a), commits that offence. 49. (1) Notwithstanding the provision of Section 25, where a sponsor, having made deduction from a member's emoluments for remittance to the scheme, fails to remit the Contribution within fifteen days of the deduction, the scheme shall, after giving such sponsor not less than seven days' notice, institute proceedings for the recovery of the deduction. (b) inform the sponsor that if he fails to pay such sum before the expiration of the notice, proceedings for summary recovery of the sum shall be filed in court without further reference to him. (3) Any sum which is the subject of proceedings of summary recovery under this section shall attract a compound interest at the rate of three percent per month. (5) Where an offence under subsection (4) is a continuing offence, the person convicted shall, in addition to the penalty prescribed in that subsection be liable to a further fine of one thousand shillings for every day or part thereof during which the offence continues. (b) fails to comply with any direction given by the Authority. Commits an offence and is liable, on conviction, to a fine not exceeding Kenya Shillings, one hundred thousand or to imprisonment for a term not exceeding one year, or to both. 51. The Cabinet Secretary in consultation with the Board shall make Regulations generally for the carrying out of any provisions of this Act. 52. The Contributions by the members of the scheme who were previously employed by the national government shall be phased in the first three years after the Commencement Date, at the rates of two per cent, five per cent and seven and a half per cent of a member's Pensionable Emoluments in the first, second and third years respectively. 53. The sponsors and members of the scheme shall be exempt from making Tier Il contributions to National Social Security Fund. (c) a person who was an employee of National Government and whose remaining period of service is five years or less, is not eligible to join the scheme and shall have his or her pension paid out under the provisions of the Pensions Act, Cap. 189 and the Widows' and Children Pensions Act Cap. 195 or any other relevant legislation. (d) a person who was an employee of a Local Authority and was a member of Local Authorities Pensions Trust and whose remaining period of service is five years or less, is not eligible to join the scheme and shall have his pension paid under the provisions of the Local Authorities Pensions Trust in accordance with Legal Notice No 50 or any other relevant legislation. (e) those Eligible Employees to whom this Act applies and who prior to its Commencement Date were employees of the National Government shall have their Pension paid out under the Pensions Act, Cap. 189 and the Widows' and Children Pensions Act, Cap. 195, for the period they served the National Government. were employee of the local authorities and who are eligible for benefits under a defined benefits scheme shall have their prior Pension benefits paid out of the closed funds, as the case may be, for the period they served the local authorities. 55. (1) An Eligible Employee of a sponsor who immediately before the Commencement Date of this Act was a member of the, Local Authorities Provident fund or cal Authorities Pension Trust fund or Laptrust Umbrella Retirement fund shall, upon the commencement of this Act be deemed to be a member of the scheme. (2) The Local Authorities Provident fund and the Local Authorities Pensions Trust fund and Laptrust Umbrella Retirement fund shall, upon the Commencement Date of this Act, remain as closed funds to new entrants and must ensure the preservation of all accrued rights of members but shall continue paying any pensions and benefits as and when they fall due. 56. (1) Any Eligible Employees who joined the service of a sponsor on permanent and pensionable terms after the first general elections under the Constitution shall be deemed to be members of the scheme with effect from the date of employment. (2) Eligible Employees of a sponsor who are employed on contractual terms may opt, upon agreement with the sponsor, to join the scheme in lieu of gratuity for the duration of their contract term provided that the extent of Contribution in such case shall be in line with section 26 of this Act. 1. (1) The Board shall have at least four meetings in every financial year and not more than four months shall elapse between the date of one meeting and the date of the next meeting. (2) Meetings shall be convened by the Secretary of the Board in consultation with the Chairperson and shall be held at such times and such places as the Chairperson shall determine. (3) The Chairperson shall preside over all meetings and in the absence of the Chairperson, the Vice-chairperson or by a trustee elected by the Board at the meeting for that purpose. (4) The Chairperson may at any time convene a special meeting of the Board, and shall do so within seven days of the receipt by the Chairperson of a written request signed by at least five other trustees. (5) Unless six Trustees otherwise agree, at least seven days' notice of a meeting shall be given to every trustee. 2. (1) The quorum of a meeting of the Board is five Trustees present and voting provided that at least two Trustees appointed under section 7 (2) (a), (b) or (c) and at least two Trustees appointed under section 7 (2) (d) or (e) are present. (2) For special meetings, the quorum is six Trustees present and voting provided that at least two Trustees appointed under section 7 (2) (a), (b) or (c) and at least two Trustees appointed under section 7 (2) (d) or (e) are present. 3. A decision of the Board shall be by a majority of the trustees present and voting and, in the case of an equality of votes; the person presiding at the meeting shall have a second or casting vote. 4. Minutes of all meetings shall be kept and entered in records kept for that purpose. indirectly interested in a private capacity, that person shall as soon as is practicable after the commencement of the meeting, declare such interest. (2) The person making the disclosure of interest under subsection (1) must not, unless the Board or committee otherwise directs, take part in any consideration or discussion of, or vote on any question touching on the matter. (3) A disclosure of interest made under subsection (1) shall be recorded in the minutes of the meeting at which it is made. (4 )A person who contravenes subsection (1) commits an offence and upon conviction is liable to a fine not exceeding five hundred thousand shillings or to imprisonment for a term not exceeding seven years or to both such fine and imprisonment. (5) A trustee or employee of the scheme shall not transact any business or trade with the scheme. The principal object of this Bill is to establish the County Government's Retirement scheme as a mandatory scheme for all County Government Officers; provide for the establishment of the scheme's Board of Trustees and provide for the scheme's management and administration. The Bill proposes to have the scheme offer lump sum payments as provident, periodic payments as pensions and income draw-downs. The proposed scheme will transition the former local authorities' and national Government employees under a national retirement scheme and retirement arrangements into one universal scheme for all the forty seven county governments besides being open to other public officers and any other person approved by the Board. Part I (clauses 1-5) contains preliminary matters. This part contains the short title, interpretation of terms, the application clause which includes all County Government employees as well as any public institution, organization or state officer who may wish to join and the scope of the Bill which is to extend the range of those who may access the scheme's services. Part II (clauses 6-21) provides for the establishment of the scheme. It establishes the County Retirement scheme fund and its Board of Trustees. It provides the procedure for appointment of the Trustees and the necessary qualifications. It also provides the Trustees' functions and powers and sets their tenure to three years renewable once based on performance. Part III (clauses 22-37) contains provisions on the administration of the scheme and provides for the appointment of the fund Manager and the Custodian. It also sets out their functions. The functions of the Administrator, who is the Chief Executive Officer, are also set out. Further, the part provides for membership of the scheme without a sponsor, the vesting of benefits, and withdrawal from the retirement savings account and retirement from the service among others. Finally, it sets out the prohibited payments from the scheme. Part IV (clauses 38-44) provides for the establishment and management of the County Governments' Retirement scheme. It contains the financial provisions and establishes the County Retirement scheme fund. It also provides how surplus funds may be invested as well and sets out a requirement for the Board to have a reserve account. provision on the making of regulations and gives this power to the Board, in consultation with the Cabinet Secretary. The repeal of theLocal Authorities Provident fund Actis also provided for in this part. Finally, this part contains a provision exempting members of the scheme from contributing to other statutory schemes and concludes with the savings and transitional provisions. This Bill does not delegate any legislative powers nor does it limit fundamental rights and freedoms. 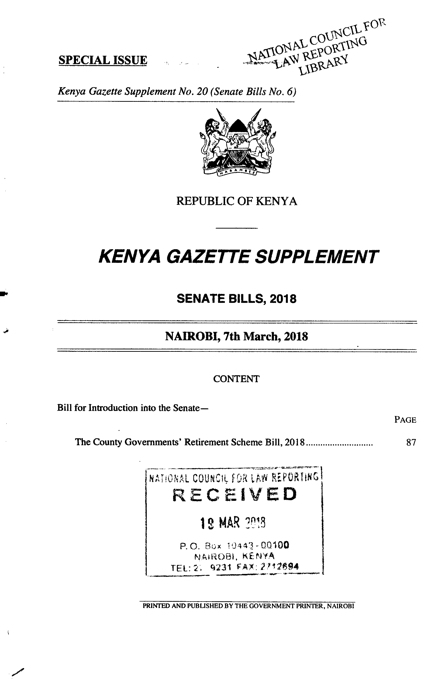 The Bill concerns county governments in terms of Articles 110(1) (a) of the Constitution in that it contains provisions that affect the functions and powers of the county governments as set out in the Fourth Schedule to the Constitution. Dated the 23rd February, 2018. Chairperson, Committee of Labour and Social Services. Created on April 8, 2019, 11:42 a.m.